Thomas Graham’s dairy entry for the 6th April makes a reference to the annexation of Austria by Germany in March 1938. Thomas took a keen interest in current affairs and frequently refers to reading new books examining the political situation. In April 1939 he was reading a book entitled ‘A pact with Hitler: the death of Austria’ by Martin Fuchs. Originally written in German, this was translated into English and published in the spring of 1939. The book was an examination of what was referred to as the ‘Anschluss’ or seizure of Austria by the German Reich. The Third Reich under Hitler had long regarded Austria as properly belonging to a Greater Germany or German Empire and there was a good deal of popular support for this amongst some of the people of that country. Germany wished to have control of Austria for ideological reasons but also because it would give them access to Austria’s plentiful supply of iron ore for their continuing drive towards rearmament. However, such a move was forbidden under the provisions of the Treaty of Versailles, signed by Germany after the end of the First World War on the 28th of June 1919. The Austrian government, aware of the feeling from Germany on the issue, planned a referendum to be held on 13th March 1938 to let their people decide on the subject. Hitler was not prepared to wait for this and sent troops into Austria on the 12th of March. 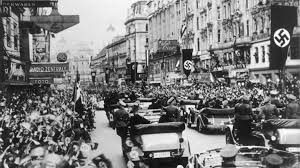 Hitler then himself travelled through Austria, arriving in Vienna on the 15th March. 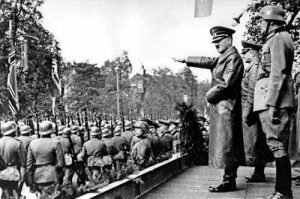 Although the forces of the Reich received a warm welcome from many Austrians who welcomed the annexation of their country to Germany, it is clear that many others were of a different mind. As soon as the Nazis established their regime they began the suppression of those opposed to them. Around 70,000 people were soon arrested and sent to prison or labour camps with Jews and Gypsies being the most numerous victims of the new regime. 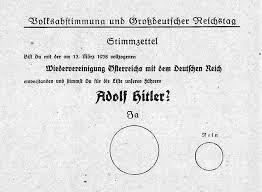 In order to ratify this arrangement, the Nazis held their own referendum on 10th April 1938. 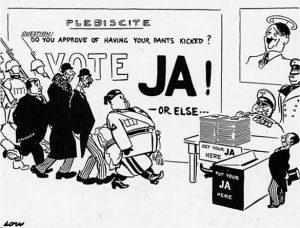 The new authorities altered the criteria for voting before this date, ensuring that 400,000 of the electorate were disenfranchised, and ran an intensive campaign for a ‘yes’ vote. Even the ballot paper was designed to encourage voters to choose ‘yes’. Thomas, having found out more about the events of the previous year, comments on the duplicitous nature of Hitler, comparing him to Satan and to the cruelty and violence of the Mediaeval Spanish Inquisition. As we know now, Thomas was absolutely correct in his views.